It has been way too long! Crafting and blogging basically went out the window during the second semester of college, aside from an occasional apron or a few knitted rows, but it's summer and so my crafting has begun again. 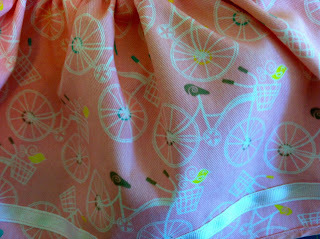 I found this lovely vintage-bicycle fabric in Jo-Ann Fabrics a few weeks ago and absolutely loved it. I wasn't sure what it would be. A dress or skirt for me was the original plan. 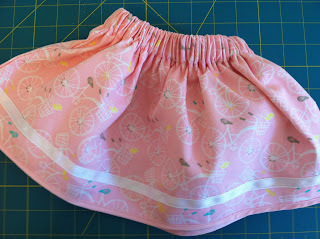 But when I pulled it out today, it just seemed like the perfect little twirly skirt for a baby girl. I followed the instructions on two different blogs, Made (danamadeit.com) and Pink Suede Shoe. I wanted something the size of a six month old, but a didn't want to make it too bunchy with having it double-layered and reversible, like the version on the Pink Suede Shoe. So, I pieced together the two versions and have a cute little twirly skirt with vintage bicycles and birds on it. I think it will work well with a pink top and a pair of bloomers. 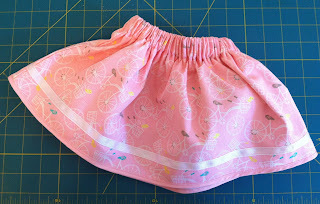 Instead of hemming the edge, I used a pale pink bias tape to edge the skirt and I decorated the edge with a white grosgrain ribbon.